In the Accounting group, you can control fiscal year settings. In the Chart of Accounts group, you can turn on account numbers — something most accountants prefer you do. In the Automation group, you can control some of QBO’s automated behavior. For example, if you don’t want QBO to prefill new forms with information from forms you entered previously, feel free to turn that setting off. In the Time Tracking section, you can control the appearance of timesheets. For example, you can opt to add a service field to timesheets so that you can select services performed for each time entry. 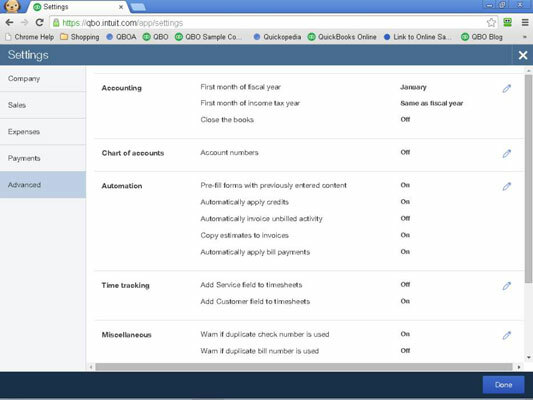 By default, QBO includes a customer field on timesheets so that you can optionally charge work performed to a customer. In the Miscellaneous group, you can make changes to a variety of settings, such as whether QBO warns you if you reuse a check number or bill number you used previously, and how long QBO should wait before signing you out because you haven’t done any work.